Delight your sweetheart with these Hershey's Kiss roses for Valentine's Day. They are very inexpensive and easy to make, and so pretty. I learned how to make these many years ago when our first child was just a toddler. Now she's 22! And these roses are even more fun to make with so many varieties of available. Red roses are always a favorite but it's okay to be creative. Choose whichever colors and flavors you like best. I've included the meaning of each rose color below for those who'd like to know! You can either give a single Hershey's Kiss Rose or wrap them together by the dozen for your most special sweetheart. For each rose place two Hershey's Kisses together, bottom end to bottom end, and hold in place. Wrap the Kisses with a small square of cellophane from top to bottom, creating a rose like shape. It is not necessary to glue the Hershey's kisses together. That would make them more difficult to eat! Gather the cellophane together at the bottom of the rosebud, but before twisting the cellophane completely closed, add a pre-cut floral stem with top leaf close to the bud. Wrap the bottom cellophane closed with floral tape, going around the stem and pulling it tight all the way down to the end. 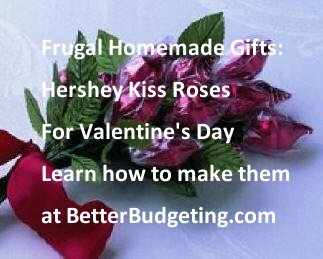 Now you have a beautiful Hershey's Kiss Rose and can make as many as you want. One, two, or several dozen. Original rose photo courtesy of Hershey's. They are so pretty as a full dozen! Copyright © 2002-2013 by Michelle Jones. All rights reserved.